Are you a youngest child? I am. My sister, Becca, is 15 years older than I am. As much as we've built a relationship now that borders on that of equals, I'll probably always have the feeling that she's trying to boss me around, and that she thinks she knows what's best for me. But I also know for sure that she loves me, and always will. Lately I've had a disturbing and enlightening look into her past, though, something I've never known about. Two of her friends went missing the autumn Becca turned 16; she and her friends were entangled in it, though they didn't even really know what was going on. But on a personal level and from a distance of over 30 years, I'm reading diaries and looking at photos, and getting this whole different view of how Becca, Valetta, Dee and others related and it's really weird. It was a life before I was even conscious of life. I was just six months old or so, and wouldn't be conscious of my big sister's love for me for another four or five years. However, thanks to looking into the disappearance of Delores Paget and Rhonda Welch I'm catching glimpses of how much Becca cared for me, and how she and Valetta, in particular, helped my mom, who was not having an easy time of it with a newborn, cope. It's humbling to see how tough it was for Becca, with all the usual 16 year old drama and trauma, and a baby to care for, too. We're going to figure out what happened to poor Delores and Rhonda, though; it's important to Becca, so it's important to me. 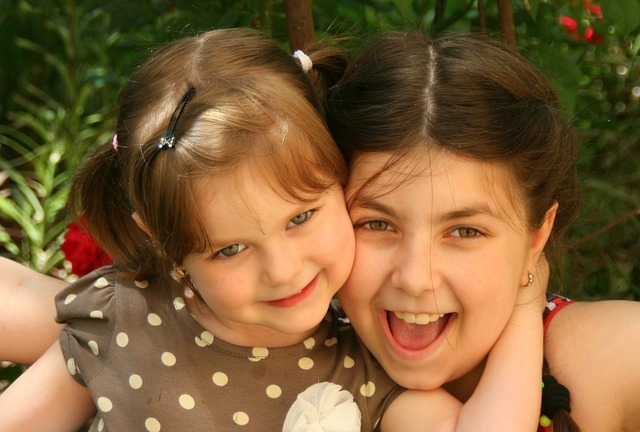 Have you ever had something happen that made you look at a sibling or old friend in an entirely new way? 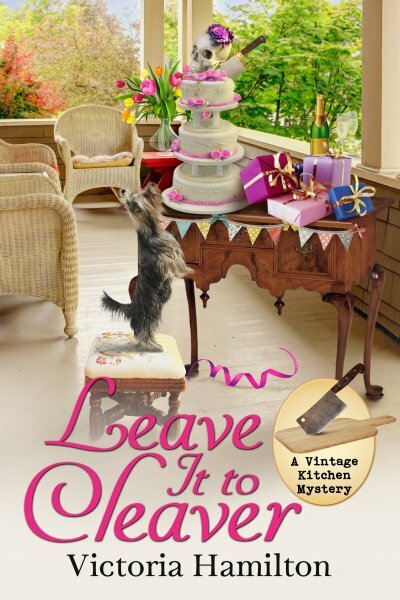 First an announcement... June 23rd, in two days, Leave It to Cleaver, Book #6 of the Vintage Kitchen Mysteries will be released, and I'm so happy to announce that I have signed to write at least three more, #7 - 9. The book following Leave It to Cleaver will be No Grater Danger and will come out in spring 2018!! And now, to the giveaway news!! Comment between now and Midnight, June 23rd, 2017 for a chance to win a "Cozy up to a great mystery! "pen, fridge magnet and bookmark AND a copy of Leave It to Cleaver, hot off the press!! Canadian and US addresses welcome. Please leave a first name and email address (yourname at yourserver dot com) in your comments! I am the youngest in my family. When I went to college, our relationship changed. Prior to that I was always the brat, too young for my older siblings. I am an only child but my Father was the youngest of 4, with about 15 yrs difference between him and the next older sibling. I could see a lot of differences in the relationships with him and his sister and older brothers. Love the title and looking forward to reading this. dbahn(at)iw(dot)net. My younger brother used to be rather chubby. When he was a junior in college, he decided to make a change and became physically fit. To this day he has stayed that way and run several half marathons, biking marathons, etc. His determination has made me admire him instead of always being jealous of how much smarter he always seemed than me. mcastor07 (at) Gmail (dot) com. I'm the oldest child, and the oldest grandchild on both sides of the family. I have one sister, nearly 3 years younger. She tells me I was bossy; I don't remember that - ha ha. I believe we have a good relationship, altho we havent lived near to each other since I went to college. And we are probably closer since our parents died [3 to 4 hour phone calls anyone?]. But I can think of nothing to see her, or anyone else, in a new light. Congrats on the new contract. Yay - 3 more books in this series! What a fun giveaway. I am 13 months older than my brother and we had the normal sister/brother relationship. We sometimes barely tolerated each other but let somebody else bother us! One time a casual comment made me understand that he actually did feel that I had been favored. I love him very much and now that both of our parents are dead, he is the only link to the family that we once were! I am the youngest of three, my sister being 13 years older. We lost our parents early in life, I turned 4 the day we lost our mom and a year later our dad. We were all split up among relatives. Fast forward 15 years, we lost our brother. We've had an up and down relationship but after my battle with cancer this past year we are very close. Yes, I have. I am so glad there will be at least three more books in the series! Thank you so much for the chance to win!! I am (soft of) a middle child. I have an older brother, a twin brother, and a younger brother. I can't wait to read this next book. Love the cover and the description of the book. 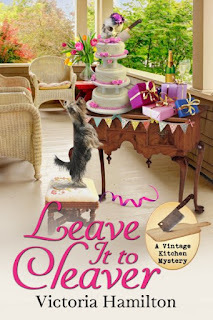 This is a great series and I can't wait to read "Leave It To Cleaver". Thank you for such a fun sounding series. You are new to me and I look forward to reading your books. Thank you. Sharon catwoman-1(at)Comcast(dot)net. I'm also the baby of the family. So excited for the latest vintage kitchen mystery! I'm so glad to hear that you'll be writing more vintage kitchen mysteries. I am the eldest of three. My brother and I have always been close but became even closer when we worked together for our father's business. Thanks for the chance to win!! After we lost both our parents my sister and I got even closer. It's a bond that will never be broken. Congratulations on the new release! Thanks for this opportunity! With so many series ending, I'm glad to hear this one will continue!!!!! Seeing someone in a different light? Many of my teaching colleagues can be so 'business' like, and one seemed to be 'all business, all the time,' until several of us to decided to make TGIF plans. After a lovely selection of hors d'overs and a few pitchers of margaritas, she was primed for 'karaoke.' Not a Grammy award-winning singer, but she was fair and animated. She shared her talent and humor and even when it was 'back to work,' she had a little 'sparkle' in her eye. Would love to win this. Thank you for the chance. I have 2 older brother's. I enjoy this series! Would love to win. I am the youngest of 8, with 19 years between myself and the oldest and 9 years between me and my next sibling! Glad this series continues!! I am the second child of four, with two brothers and one sister. She is four years younger than I am so we weren't very close. Thanks for the giveaway. Thanks for a chance to win a copy. I'm the youngest of 3 girls. #3 OF 4 kids. I wish we were all closer. I try to keep the lines open, but end up being the nag in the family. Thank you for the fun giveaway. I never realized how wonderful my brother was until he became a father.